Super Polishing Machine FKP-1020F | Products | Kuroda Precision Industries Ltd. This automatic Small Polishing Machine has been developed on the concept the "High degree of precison work with ease" and concentrating KURODA's technical know-how and expertise. Main body is compactly designed so that two or more units of FKP-1020F can be arranged in a parts manufacturing line. No necessity for high degree of polishing skill. 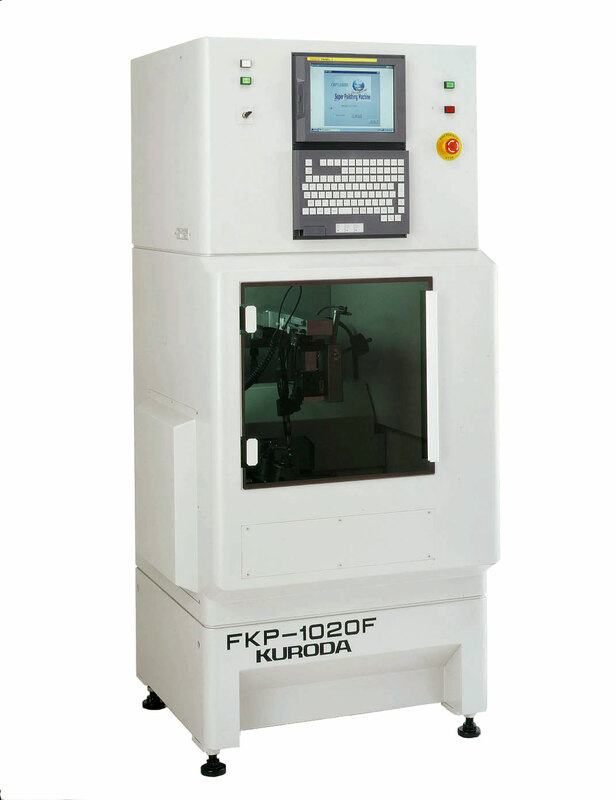 With this FKP-1020F, you can utilize a full of range KURODA's technical know-how in polishing through the software installed in the built-in personal computer, eliminating the nees for high degree of polishing skill. The FKP-1020F can be customized by accumulating your own data and technical know-how. Powerfull software for aspherical surfaces is installed. you can input formulas of up to 20th power for aspherical surfaces. Therefore, aspherical surface with extremely complicated and peculiar curvature can be uniformly polished in the normal direction. Software for close-tolerance modification is also installed. Partial modification for enchancing configurational accuracy in the polishing process has not been expected up to now. However, the FKP-1020F incorporates the software to control the staying time of the polishing head, making more accurrate modification possible. With this software, you can input modification pitches at 0.1, 0.05 and 0.02mm, respectively. *Both X and B axes are simultaneously controlled by PC. Requests for sample polishing are accepted at any time. To request sample polishing, please contact us using the “Inquiry Form” below.